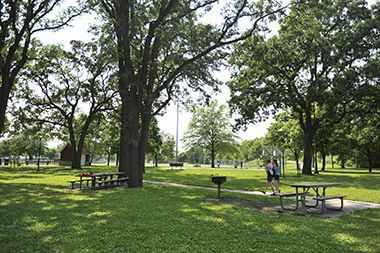 Brackett Field Park	An urban escape featuring the signature 35-foot Rocket sculpture, and a variety of amenities to entertain the family. Master Plan: After two years of extensive community engagement, the Brackett Field Master Plan was approved in 2016 as part of the South Service Area Master Plan. The Brackett Field Master Plan will guide outdoor park improvements at Brackett Field for the next 20-30 years. Click the link below to view the master plan. The 35 ft. Return Journey sculpture was originally installed in 1962 and is now a signature landmark to the park. 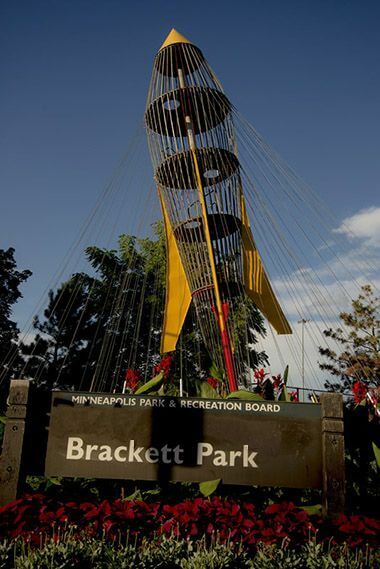 The Brackett Rocket was a children’s climbing structure symbolic of the entrance of the United States into the “space race.” The Rocket was partially closed in the late 1990s because it no longer met safety standards. In 2004 it was removed as part of park renovation. The community, led by the Brackett Rocket Boosters, rallied to bring the Rocket back to the park in October 2007, culminating a two-year process that included fundraising and promotional activities. The Rocket was modified and transformed into public art to preserve its original symbolism by Minneapolis resident and artist Randy Walker. Poised for takeoff above an oval of boulders and smoke-colored shrubs, the sculpture is surrounded by 84 steel cables that give the appearance of a space liftoff. Name: The park was referred to as the Short Line Playground for its proximity to the railroad tracks from the time it was designated for acquisition on November 16, 1921 until it was formally named George A. Brackett Field on January 17, 1923. George Brackett was one of the original park commissioners appointed in the legislation that created the park board in 1883. He was then elected to serve another three year term. Brackett was one of the most public-spirited of all early leaders of the city, serving as mayor, councilman and the city’s first fire chief. He was among the handful of people who had pushed for years for the city to acquire parks and helped lead the campaign to gain approval of the park act during the referendum of 1883. Brackett was also a leader in founding several charities in Minneapolis. In 1885, the governor of Minnesota appointed Brackett to a five-member commission to acquire land for a state park at Minnehaha Falls. When the legislature did not have the money to buy the land around the falls for the park, Brackett secured temporary private financing to ensure the acquisition could be completed. Brackett Field, a portion of which was still unplatted at the time, was designated for acquisition November 16, 1921. Awards for condemning the land for the park amounted to nearly $35,000. The entire cost of the acquisition and initial improvements, a combined cost of almost $92,000, was assessed against neighborhood property for payment over ten years. Improvements to the playground park began almost immediately. 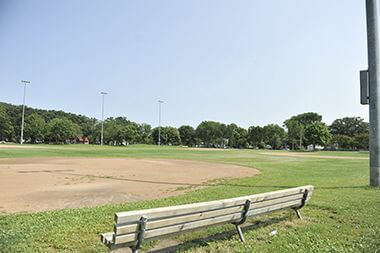 Park superintendent Theodore Wirth had included in the 1921 annual report a proposed plan for the still unnamed field, noting that it was devoted to “concentrated gymnasiums and playground facilities.” “Every foot of the twelve-acre ground,” he wrote, “is taken advantage of in some useful manner.” Brackett was one of the first neighborhood parks in the city designed from the start exclusively for active recreation with almost no landscaped open spaces. In his 1923 report, Wirth wrote that improvements at Brackett Field were completed faster than any other property in the history of the park board. A shelter for the park took a bit longer to build however. When bids to build a modest shelter at the park came in more than 30% higher than Wirth’s estimate of $12,000 in May 1923, the park board rejected them all. It sought bids again that December and found one more to its liking. The first shelter was built in early 1924. 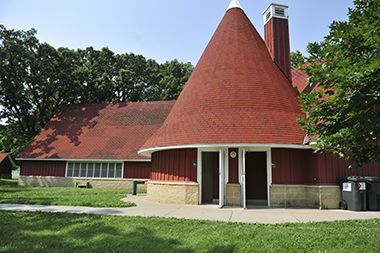 With the rapid growth in use of park recreation facilities in the 1930s, Brackett was first designated as a year-round recreation center in 1935. With the financial challenges at the end of the Depression and World War II, however, Brackett didn’t remain a full-time, year-round facility for long. In 1958 Superintendent Doell reported once again that Brackett was one of three new year-round recreation centers. In the early 1960s residents near Brackett Field began circulating petitions to support renovation of the park with assessments split 50-50 between the neighborhood and the city. 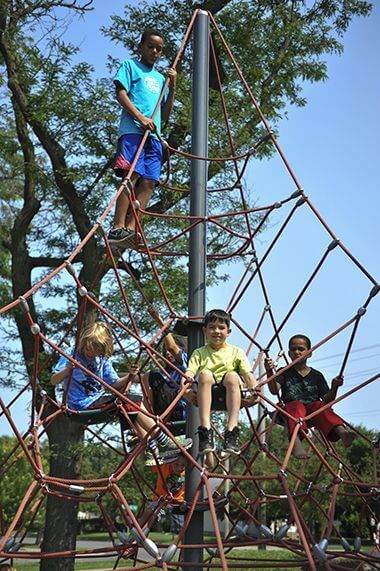 With the success of the petition drive, Brackett was upgraded in 1963, including a renovated shelter and new playground equipment that featured a jungle gym and slide in the shape of a rocket. It was the ultimate in modern play equipment. The Brackett recreation center was expanded in 1980 with a basement renovation, along with other site improvements. 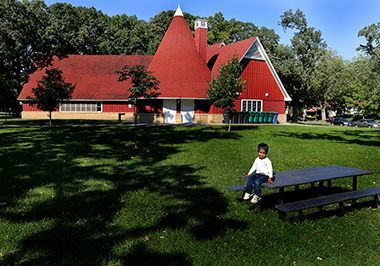 The recreation center was demolished in 1999 and replaced with a new building, designed by architect Milo Thompson, with the help of Neighborhood Revitalization Program (NRP) funds. 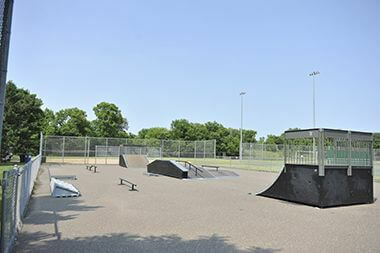 A skate park was built at Brackett Field in 2005, taking the place of two of the four park tennis courts. 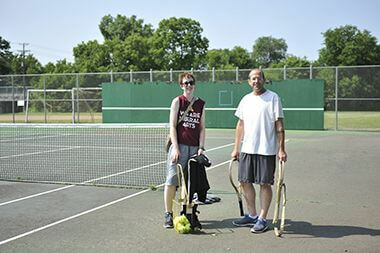 The two remaining courts were resurfaced. At that time the park also witnessed the return of the Brackett Rocket. The jungle gym and slide installed in the park in the 1960s, which had become a neighborhood icon, was converted into a park sculpture in the southwest corner of the park. 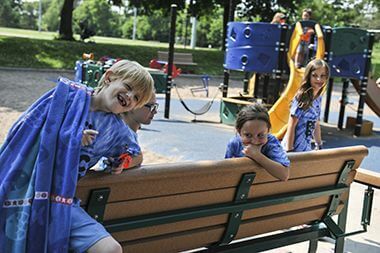 When the park was renovated, innovative new playground equipment, designed in Denmark, was also installed. A project completed in 2014 improved drainage and redesigned a path traveling through the park, making it safer for both pedestrians and cyclists. 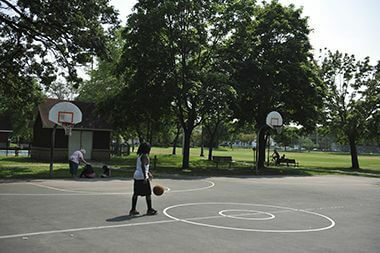 Brackett Park includes Brackett Recreation Center. 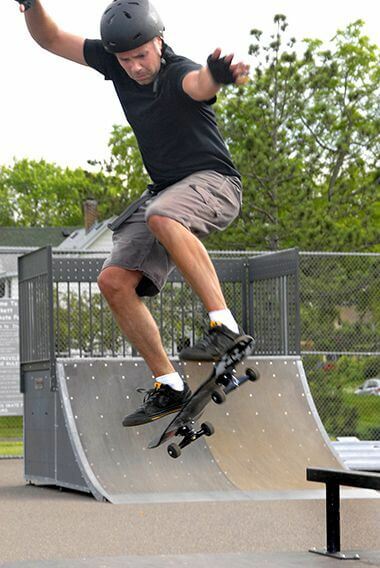 Brackett Park is one of six Minneapolis parks to feature a skate park. The 35 ft. Return Journey sculpture was originally installed in 1962 and is now a signature landmark to the park. To reserve a field, court, or rink for two or more dates, visit our athletic permit page. 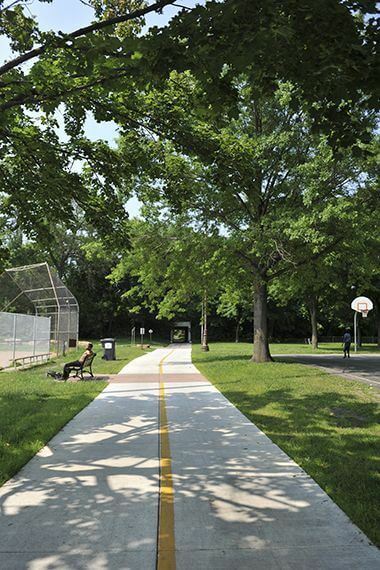 Enjoy a shady stroll along Brackett Park's paved walking trails. 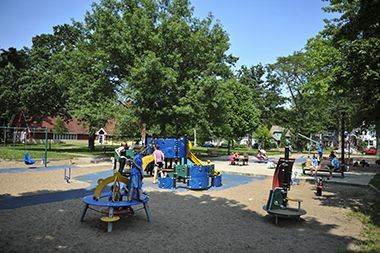 Brackett Park features both a full size playground and a tot lot for the smallest family members. 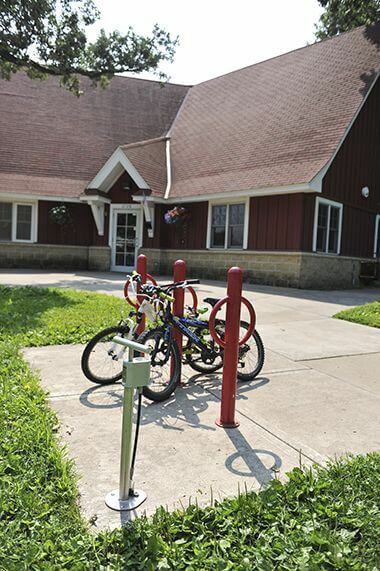 Stop by Brackett Recreation Center to fill up your bike tires. 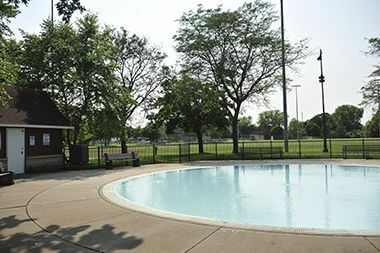 Cool off in the summer at the Brackett Wading Pool. See our other wading pool locations.